James took up the bassoon at the age of 13 at Out of School Music Classes (OSMC) in Invercargill and through school. Although James plays a Heckel system bassoon he has learned French bassoon (Buffon) while living for a year in Arras, France. He has played in four orchestras in four different places around New Zealand as well as chamber groups during that time. James has always played in School Concert Bands and Orchestras at the schools that he has taught Maths and French in. He currently plays in the Waimea College Orchestra. He has played a few recital pieces for small community concerts. 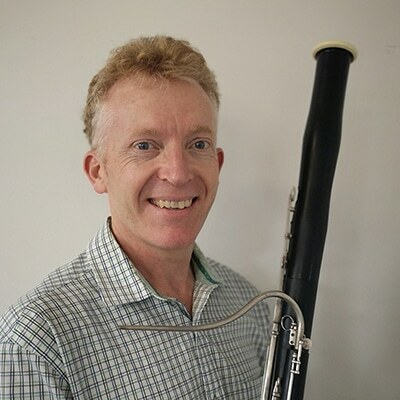 James has taught bassoon at OSMC in the late 1990s and has been wanting to teach bassoon again to pass on the skills he has developed. He has taught music for a year 7 and 8 level in 2016 and is currently a fulltime secondary Maths teacher. The bassoon is generally not suitable for some younger students due to its size – a good pathway can be learning a smaller wind instrument first. James is a firm believer in making lessons fun and enjoyable so he likes to incorporate breathing skills, scales and pieces as parts of the lessons. He also believes that learning technique, including scales and studies are just as important as playing pieces. James is happy to prepare students for exams, but equally would welcome students learning “just for the enjoyment of it”.